Less than 24 hours before its scheduled unveiling, a number of HTC First photos made an appearance. Unlike yesterday's image however, today's images reveal the Facebook device's Facebook Home UI of its Android OS. 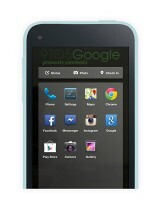 The photos of the device reveal a minimalist UI with full-screen imagery, and stock Android icons. The app drawer on the other hand, reveals buttons for instant access to Facebook status updates, photo uploads, and location check-ins. The HTC First with Facebook Home will break at 1PM Eastern Time tomorrow. Be sure to tune in for the full scoop on both the device and its UI.